Home > Black & White, Cityscapes, Lifestyles	> I Built It, and They Came – Thanks for All the Blog Visits. I Built It, and They Came – Thanks for All the Blog Visits. To show my appreciation for the many thousands of visits to my photo blog since launch, I move back to an image from my Cityscape series. 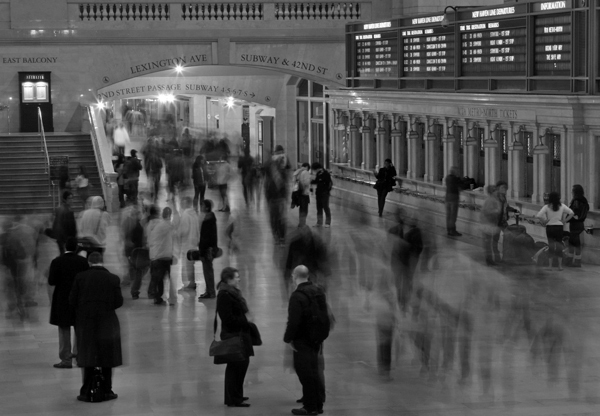 This image of commuters moving between trains at rush hour through the main concourse of Grand Central Station was captured from a higher elevation at one end of the building. Not having a tripod with me, I needed to rest the camera on a concrete ledge and an article of winter clothing to raise the lens to the desired level. Steadying the camera was required to capture both the individuals that were stopped and blur those that were moving. I greatly appreciate my blog visitors and will continue to post images that I hope you all enjoy…moving forward.